Commissioned built by J. Paul Rainey to house the overflow of guests that he entertained out at his 10,000 acre hunting lodge in Cotton Plant. 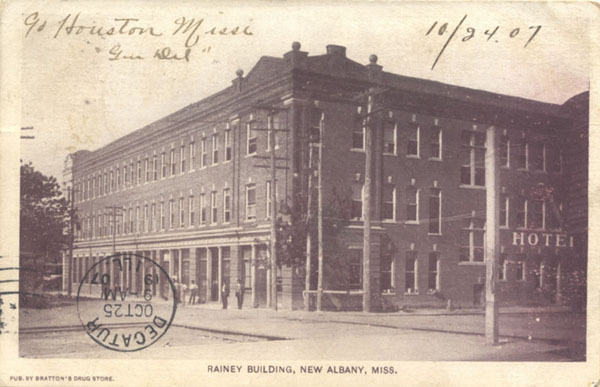 The Rainey Hotel was quite a large and elegant building by north Mississippi standards. Intending to mimic hotels in New York and Europe, he decorated it on a grand scale including imported Italian marble for the floors. A European chef was brought in to prepare meals for the guests. At this time, it was one of the most luxurious hotels in Mississippi. The hotel was later destroyed by fire. These pictures were provided by Joe Mercer. © 2007, by Melissa McCoy-Bell. All rights reserved.